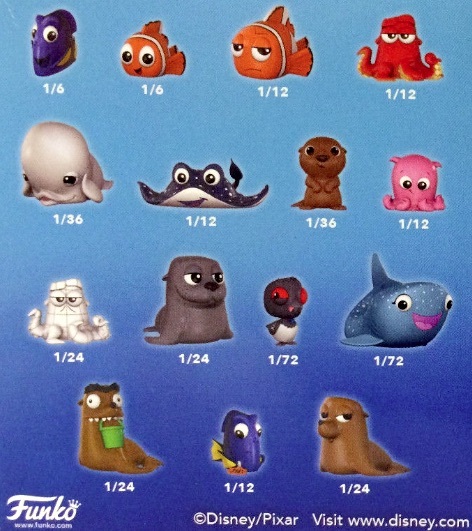 Shrinking down the stars of the animated film, 2016 Funko Finding Dory Mystery Minis contains a mix of subjects first seen in Finding Nemo, as well as several new faces. The Finding Dory collectible is issued in a blind-box format, keeping the subject a surprise until the package is opened. The eagerly anticipated sequel to one of the biggest movies of the 2000s again features a look at the excitement taking place in the ocean. This time centering on Dory, the likable regal blue tang voiced by Ellen DeGeneres, there are quite a few options available to collectors and fans. 2016 Funko Finding Dory Mystery Minis offers a detailed list of choices from the film. Established subjects include fan favorites Nemo and Marlin along with two figures for Dory. These are joined by a slew of new characters, including Modern Family alums Ty Burrell, as Bailey (beluga whale), and Ed O'Neill as Hank the octopus. Figures can be obtained by the box or by the case. Cases include 12 figures, meaning that some of these will be tougher to track down with more difficult odds. This makes the blind-box aspect more exciting and full sets more difficult to complete since there are 15 figures in total. Each of the 2016 Funko Finding Dory Mystery Minis vinyl figures are approximately 2.5 inches tall. Current information is listed below and more details will be added as they are made available. There are also larger Pop! 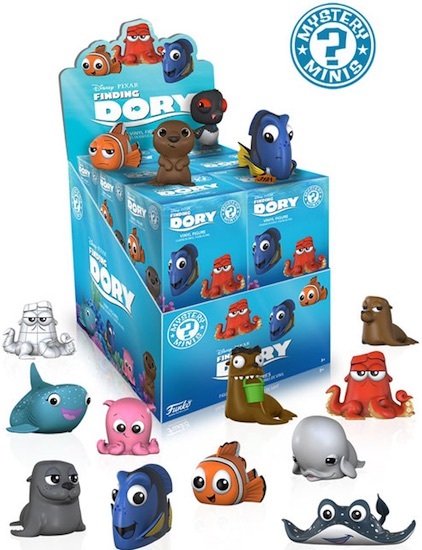 versions for Finding Dory but the figure variety is much more limited. Shop for Funko Finding Dory Mystery Minis on eBay.